Censorship of the television show South Park has sparked the controversial Everybody Draw Muhammad Day. Censorship of the image of Mohammed, believed by Muslims to be a prophet, has led to backlash in the form of Everybody Draw Muhammad Day, scheduled for May 20. The idea of a mass protest was launched after the creators of the television show 'South Park' were threatened on an Islamist website over a show making fun of Islamist censorship of Muhammad's image. Following the threats, the next episode of Comedy Central's 'South Park' was aired with the word “Muhammad” bleeped out. Writers Matt Stone and Trey Parker expressed displeasure with the decision to censor the show. Posters advertising the event have been circulating online. The ads were created by a group calling itself Citizens Against Citizens Against Humor. “Do your part to both water down the pool of targets and, oh yeah, defend a little something our country is famous for... the first amendment,” they urge. Despite his concerns, more than 2,300 people remain listed as “confirmed guests” of Everybody Draw Muhammad Day. Many Muslims consider visual depictions of Muhammad to be blasphemous and forbidden by Islamic law. 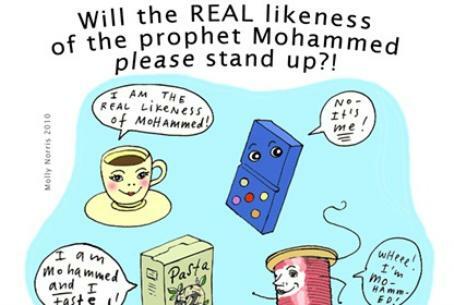 In 2005 a Danish paper published cartoons of Muhammad, in what editors said was an attempt to examine the concepts of criticism of Islam and self-censorship. The cartoons sparked riots throughout the Muslim world that led to dozens of deaths, and some of the artists involved faced death threats.